Earth's mantle temperatures during the Archean eon, which commenced some 4 billion years ago, were significantly higher than they are today. According to recent model calculations, the Archean crust that formed under these conditions was so dense that large portions of it were recycled back into the mantle. This is the conclusion reached by Dr. Tim Johnson who is currently studying the evolution of the Earth's crust as a member of the research team led by Professor Richard White of the Institute of Geosciences at Johannes Gutenberg University Mainz (JGU). According to the calculations, this dense primary crust would have descended vertically in drip form. In contrast, the movements of today's tectonic plates involve largely lateral movements with oceanic lithosphere recycled in subduction zones. The findings add to our understanding of how cratons and plate tectonics, and thus also the Earth's current continents, came into being. Because mantle temperatures were higher during the Archean eon, the Earth's primary crust that formed at the time must have been very thick and also very rich in magnesium. However, as Johnson and his co-authors explain in their article recently published in Nature Geoscience, very little of this original crust is preserved, indicating that most must have been recycled into the Earth's mantle. Moreover, the Archean crust that has survived in some areas such as, for example, Northwest Scotland and Greenland, is largely made of tonalite–trondhjemite–granodiorite complexes and these are likely to have originated from a hydrated, low-magnesium basalt source. The conclusion is that these pieces of crust cannot be the direct products of an originally magnesium-rich primary crust. These TTG complexes are among the oldest features of our Earth's crust. They are most commonly present in cratons, the oldest and most stable cores of the current continents. 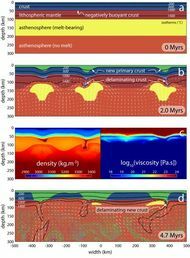 With the help of thermodynamic calculations, Dr. Tim Johnson and his collaborators at the US-American universities of Maryland, Southern California, and Yale have established that the mineral assemblages that formed at the base of a 45-kilometer-thick magnesium-rich crust were denser than the underlying mantle layer. In order to better explore the physics of this process, Professor Boris Kaus of the Geophysics work group at Mainz University developed new computer models that simulate the conditions when the Earth was still relatively young and take into account Johnson's calculations. 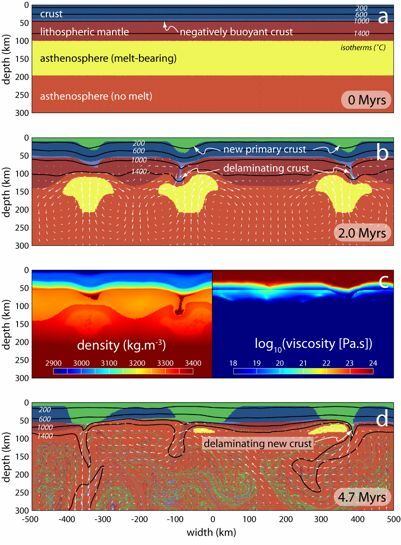 These geodynamic computer models show that the base of a magmatically over-thickened and magnesium-rich crust would have been gravitationally unstable at mantle temperatures greater than 1,500 to 1,550 degrees Celsius and this would have caused it to sink in a process called 'delamination'. The dense crust would have dripped down into the mantle, triggering a return flow of mantle material from the asthenosphere that would have melted to form new primary crust. Continued melting of over-thickened and dripping magnesium-rich crust, combined with fractionation of primary magmas, may have produced the hydrated magnesium-poor basalts necessary to provide a source of the tonalite–trondhjemite–granodiorite complexes. The dense residues of these processes, which would have a high content of mafic minerals, must now reside in the mantle.